The continued deadlock over Brexit brings with it the possibility of a snap General Election. Amidst the endless discussion and political paralysis over Brexit, the parties are quietly sound-boarding potential manifesto pledges. One potential Tory policy in a snap election appears to be a reduction in university fees. Theresa May’s review of university funding seems likely to recommend a cut in fees from a £9,000 maximum to £7,500. This policy would be aimed at winning over younger voters. The public discussion around a reduction in fees focuses predominantly on how best to fund universities. Those against a reduction warn that this may reduce available places. Unsurprisingly, many senior members of the Conservative party argue against any reduction in the fees that they were responsible for raising. Jo Johnson, former Universities Minister, argued in January that a reduction in fees would lead to less places being available to disadvantaged students. Damian Hinds, the Education Secretary, is of a similar view. He stated there is no need to reduce the £9,250 per year fees as there is no evidence these acted as a deterrent to students. The universities themselves are concerned that reductions in fees will bring with them a reduction in funding. Their worries seem to be justified as the public statements around fees do not include commitments to maintain investment into already stretched universities. When arguing that high fees actually help disadvantaged students, Tories such as Johnson and Hinds overlook the other policies the government should be pushing to remove inequalities. These could include quotas on places in top universities and ensuring that higher education is adequately funded from direct governmental investment. The public debate itself however is one-dimensional and framed primarily in terms of how many university places are available and affordable. There is a much deeper and overlooked notion at the heart of the tuition fee debate, between individualisation and collective responsibility. When students are made responsible for paying their own fees and lumbering themselves with debt, their relationship with education is individualised. The system makes students individual educational consumers, responsible solely for funding their own education. Individual student debt for education is usually justified as it is expected that those with university education will attain higher wages and salaries. The benefits of a degree are therefore also phrased in individualised terms. This system of self-funding gives the perception that education is an individual choice with individual benefits; it limits the perception of education as a collective benefit. It is patently not the case that education only advances individuals. Society as a whole benefits from new generations being as educated as possible; students become the doctors, nurses, teachers, engineers, researchers that provide services for all. Regardless of whether we have university educations ourselves, we will benefit from the skills developed by others in university education. Those who educate themselves develop knowledge that benefits us all collectively. This is how the discussion around university funding should be framed. In arguing that taxpayers should collectively fund the education of future generations, we would encourage a collective understanding of the benefits of education. Fundamentally, a system where education is government funded creates the understanding that ensuring future generations are educated is a social responsibility we share. In order to collectively benefit from the education of others, we have to support future generations. We need a much deeper discussion of how education is funded in the UK. Fees are not about how many university places there are, but about whether we perceive education to be an individual responsibility or a collective benefit. Labour is right to argue that universities must be free. They must make the argument against individualisation and consumerism in education more vehemently in future debates. We need more than a one-dimensional and misleading conversation about whether individual debt is the best way to provide places. This can be done with or without individual fees. 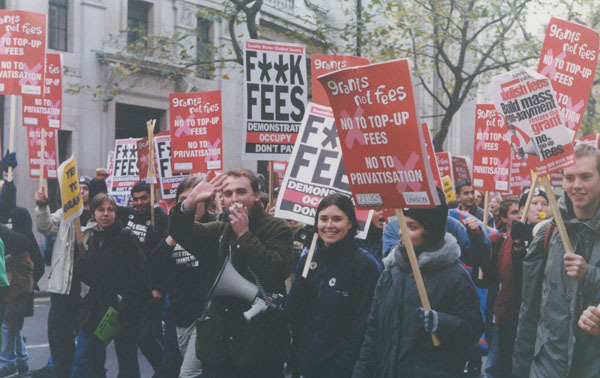 The university fee debate is about something much more fundamental. Joe Barson is a political caseworker in the Northwest. Would students like another 50K of debt added to their 450K of state debt? @NHSGP Try reading the article.